"Professor Bill Yousman Speaks on the Rhetoric of Hate in Media and Politics"
Hate speech and imagery is a dangerous thing and all too prevalent across mainstream media and politics suggested Bill Yousman, associate professor in Sacred Heart University’s School of Communication, Media & the Arts. His talk titled, “The Rhetoric of Hate in Media,” was the second of a four-part "Heart Challenges Hate" series of lectures and was attended by students, faculty, staff and several community residents. 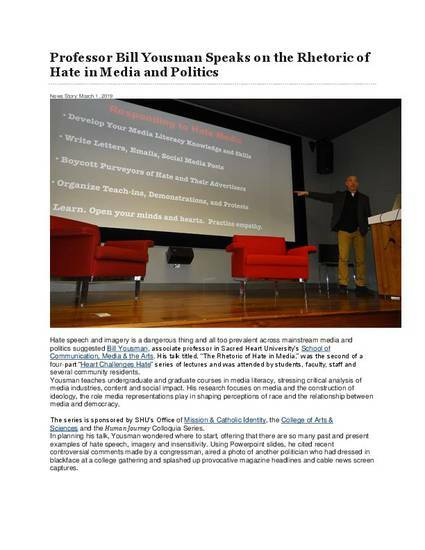 Professor Bill Yousman speaks on the rhetoric of hate in media and politics (1 March, 2019). Sacred Heart University News Story.